Williams have confirmed the team's 2019 Formula 1 car will break cover on February 11, completing the schedule for a week full of car reveals. Williams were the last team to set a date for their car reveal, but will do so ahead of many of their rivals. A big change could be in the offing for Williams in 2019, having lost previous title sponsor Martini, the Italian alcoholic drinks brand that brought its famous striped livery to the team as part of a partnership that had been in place since 2014. Williams raced with similar markings, with mostly white and blue used, in countries that ban alcohol advertising last year, but their direction for the year to come remains something of a mystery. The once-great team will hope for greater fortunes in 2019 after putting a miserable 2018 campaign behind them. Williams finished bottom of the constructors' championship, scoring just seven points across the season. It is all change at Grove, however, with several changes in technical staff made throughout last year, while the race squad is completely new. Lance Stroll departed for Racing Point after his father Lawrence took over the team formerly known as Force India, while Sergey Sirotkin was not retained after scoring a solitary point in his rookie season. 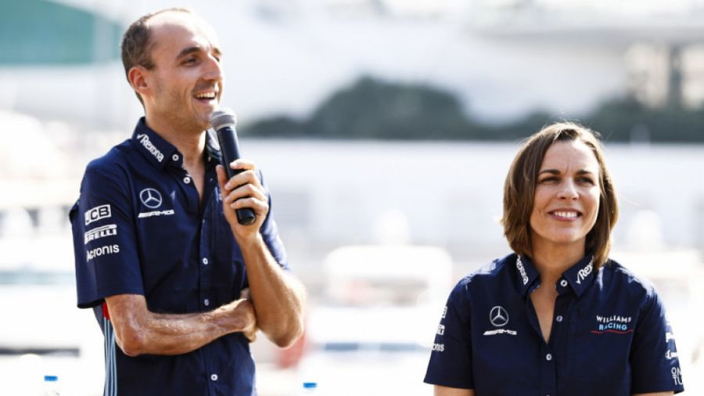 Robert Kubica will complete a fairytale return to the grid, eight years on from suffering life-altering injuries in a rally crash, while alongside him Formula 2 champion George Russell – a Mercedes junior driver – will begin his career at the highest level.